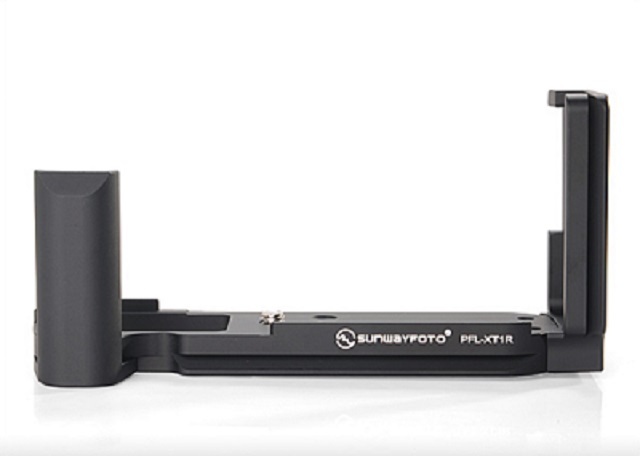 One month after their announcement in the recent China P&E Show in Beijing (April 25-28, 2014) Sunwayfoto® has released two Custom Plates with Grip for the very successful Fujifilm X-T1 mirrorless interchangeable lens camera. 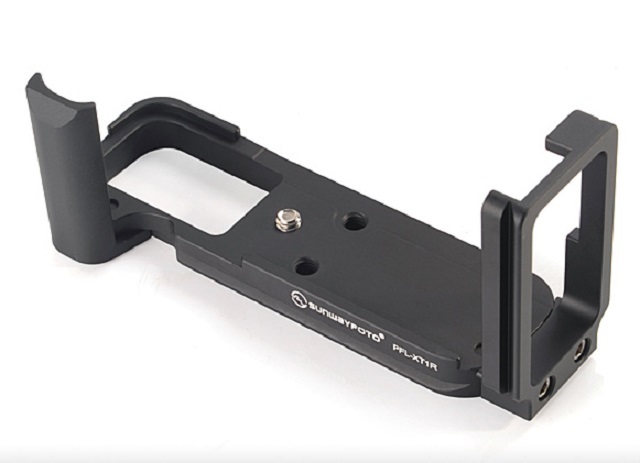 The plates have a modular design, with the two part PF-XT1R sporting a removable hand Grip while the three part PFL-XT1R featuring also a vertical plate, thus forming an L plate / bracket. Both plates follow the latest changes in Sunwayfoto finish we saw recently in the Sunwayfoto PCL-6DR Custom L Bracket for Canon EOS 6D (Body) Update, which means a more robust satin hard-coat anodizing as well as the letter "R" at the end of their model name, which signifies full compatibility of their Arca-Swiss® style dovetail with RRS® Lever Release clamps. On top of the enhanced features, their price tag is set unbelievably lower than what we were used, for quality products coming from Sunwayfoto, up to now. 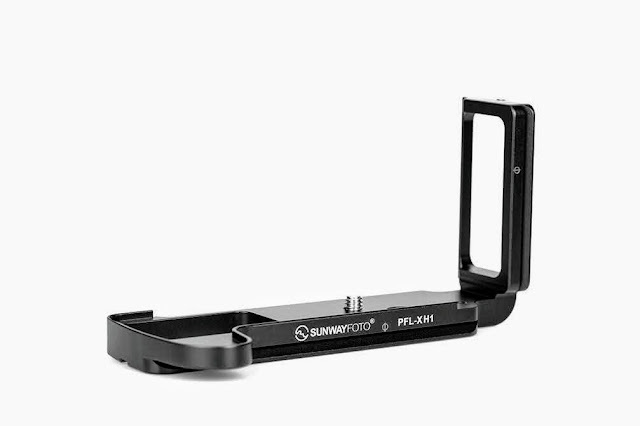 The Sunwayfoto PFL-XT1R L Plate is a full length plate designed to cover the base of the camera. A quite long ridge at the front and a curved ridge at the back undertake the role of immobilizing the L plate on the camera. It is worth mentioning that the base plate dovetail and the vertical plate dovetail are aligned unlike many rival L plates. So that a change in camera orientation does not affect framing or focusing. 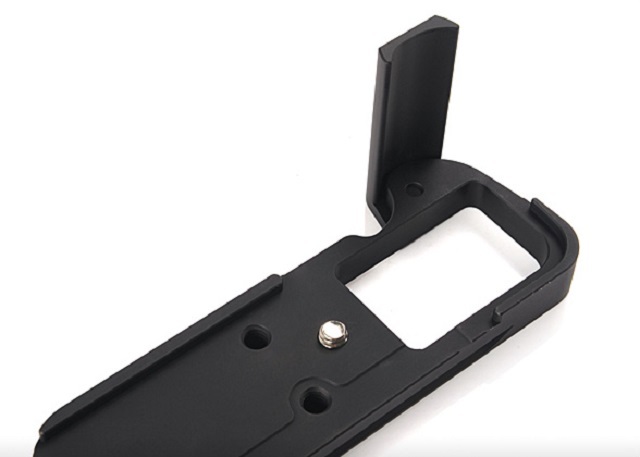 The hollowed out bottom of the plate has a large opening for easy battery door access and an M3 safety stop screw on one side. 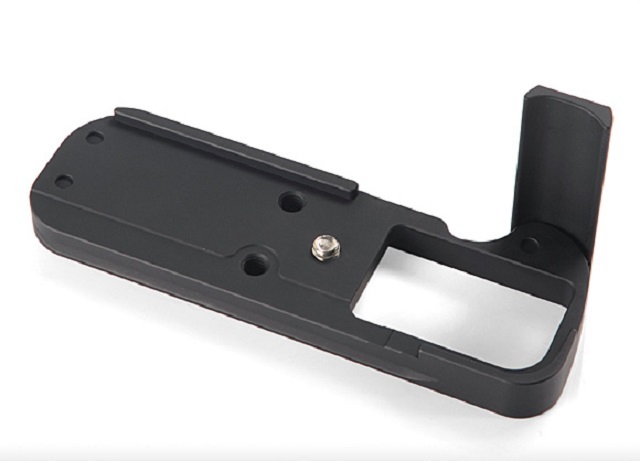 Besides the camera attachment 1/4"-20 captive screw which conveniently sports both a hex socket and a slot, there is also two 1/4"-20 threaded holes in the middle of the base plate; facilitating direct mounting on a pod or other device with a 1/4"-20 stud. 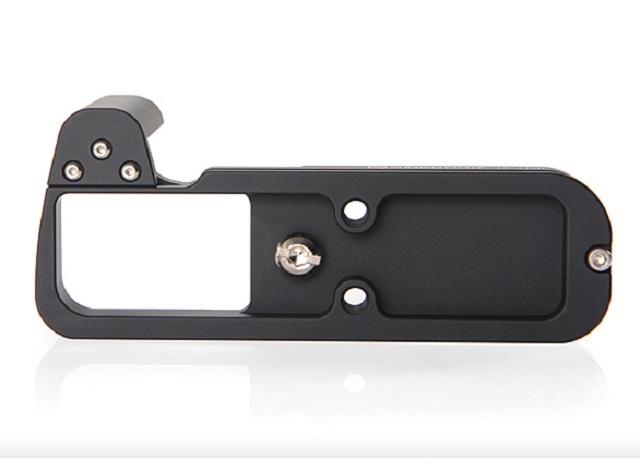 As mentioned in the beginning the Sunwayfoto PFL-XT1R L Plate is comprised of three parts. 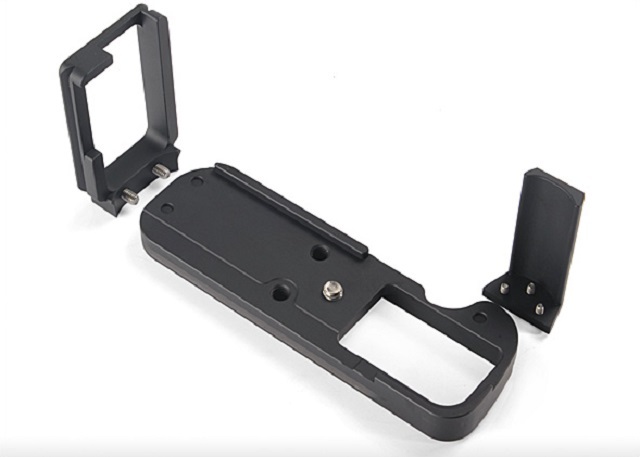 The hand-grip and the vertical plate may be removed anytime the user finds it convenient, via the provided Allen hex keys and be operated as a simple base plate. The vertical plate is aligned and held in place by two screws, while the hand-grip is attached via 3 smaller screws. 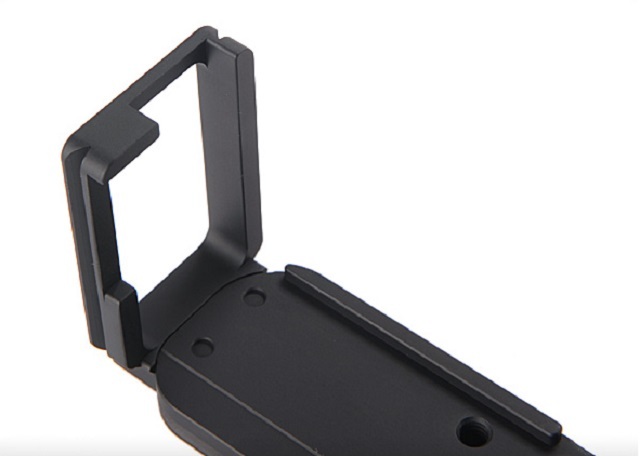 The vertical plate has all appropriate cut-outs in order to allow full access to the left-side camera connectors and strap loop. 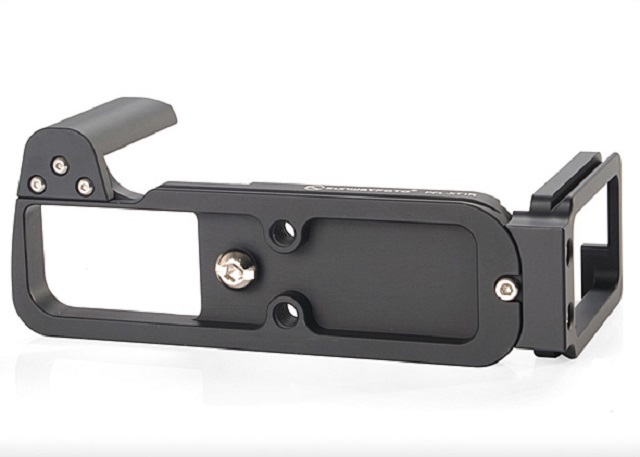 The small removable hand Grip enhances the handling of the camera while protecting the camera grip from bumps. 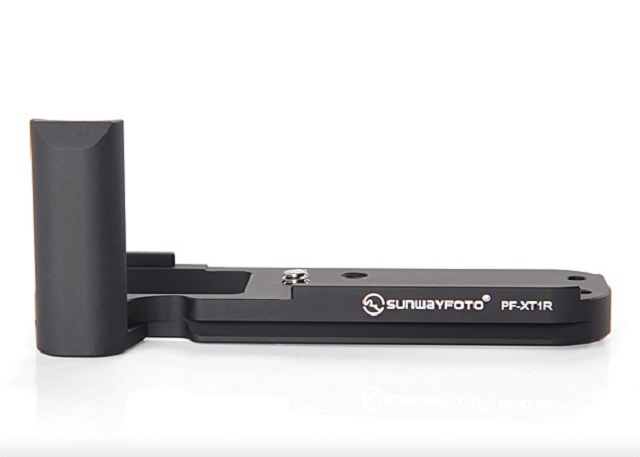 The PF-XT1R is exactly the same with the PFL-XT1R minus the vertical plate. 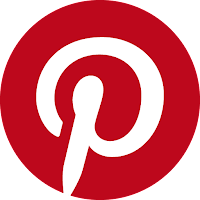 Although the price difference between them is not so substantial as with rival products, users that do not require a vertical plate may opt for the PF-XT1R plate, saving also a mere 10gr of carrying weight. All characteristics and features of the PFL-XT1R are found on the PF-XT1R as well. Same as with all Sunwayfoto products, all necessary stainless steel screws and tools are included in the package. Both plates are accompanied by 1 x M3 safety stop screw, 1 x 1/4"-20 captive screw and the appropriate sizes of Allen hex wrenches for the M3 and 1/4"-20 screws. The PFL-XT1R though, will come together with an extra Allen wrench for the vertical plate retaining screws. Expected prices for the new PF-XT1R and the PFL-XT1R L plate are US$ 45.00 and US$ 59.00 respectively. Both plates are expected to be in the stores sometime next week.